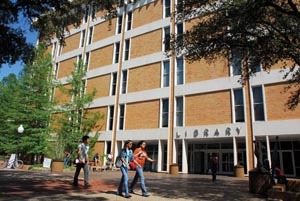 The UT Arlington Libraries has launched an on-site textbook-lending pilot program. The Textbook Project currently includes 60 books needed for courses such as anatomy, biology, chemistry, economics, engineering, English literature, history, political science, and trigonometry. Librarians selected the books based on 1000- and 2000-level classes that have a high drop, fail, or withdrawal rate. Students may check out the textbooks for up to two hours. Before now, UT Arlington allowed students to check out textbooks, but it has been policy not to offer current textbooks. Read more about the Textbook Project and available books. 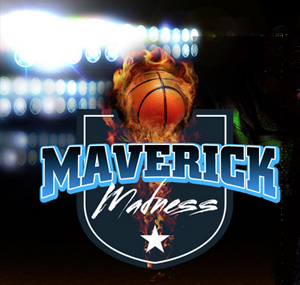 Invite the family to come to Maverick Country for Parent and Family Weekend, Friday-Sunday, Oct. 24-26. The weekend features a long list of events that allow students to show their families what it's like to be a Maverick. Activities include faculty spotlights, a fall festival with live music, glass-blowing demonstrations, Movin’ Mavs basketball, and more. Check the Parent and Family Weekend schedule for more events, including the American Jazz Composers Orchestra Concert, and the National Alternative Fuel Day Odyssey, both on Saturday. Online registration continues through Wednesday, Oct. 22. Mary Matalin, left, and James Carville shared differing opinions and a few laughs at the Maverick Speakers Series on Monday night at Texas Hall. The husband-and-wife political consultants for opposing parties discussed campaign strategy, student involvement, voting, and more. James Stavridis, retired Navy admiral, presents "Sailing the Cyber Sea: The New Realities of 21st Century Security" on Tuesday, Nov. 4. Go to utatickets.com for ticket information. UT Arlington continues to closely monitor information from federal, state, and regional public health authorities related to the recent cases of Ebola Virus Disease in Dallas. There have been no known incidents of Ebola-related illness within the University community. A general information session about the illness, prevention, symptoms, and public health protocols is scheduled noon-1 p.m. Wednesday, Oct. 22, in the Rosebud Theatre at the E.H. Hereford University Center. Scheduled speakers include Tim Quinnan, vice president for student affairs; Anne Bavier, dean of the College of Nursing; and Cynthia Simmons, medical director of the Public Health Authority of the City of Arlington. Information about Ebola Virus Disease, symptoms, prevention, and treatment is published online by the Centers for Disease Control and Prevention and by the Texas Department of Health Services. Regional information is available through Tarrant County Public Health and Dallas County Health & Human Services. Continue to monitor the University’s home page—www.uta.edu—for the most current UT Arlington information on the issue. Need a professional-looking photograph for your LinkedIn profile? Want to know how to use the social website for your job search? The Career Development Center can help. Learn more about using LinkedIn for your job search at 2-3:30 p.m. Wednesday, Oct. 22, in Room 121 in Science Hall. Sign up for a time slot to have your LinkedIn photo taken Monday, Oct. 27, at the center, Room 216 in Davis Hall. Prepare to have a headshot taken by dressing professionally. The photo will be emailed to you. 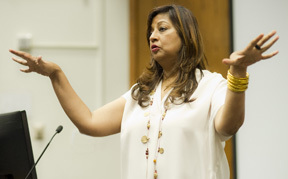 Director and executive producer Lekha Singh discussed her film Beyond Right and Wrong to more than 100 students, staff, and faculty at a screening of the documentary last Wednesday in Nedderman Hall. The film explores justice and forgiveness as people from different sides of violence share their stories of the Rwandan genocide, "The Troubles" in Northern Ireland, and the Israeli-Palestinian conflict. Singh said she wants the movie to start conversations about forgiveness and moving forward. The film is shown nationwide on college campuses and is used for marriage counseling, in prisons, and by the military in dealing with PTSD. Taste global goodies or test your worldly wisdom during International Education Week, set for Monday-Thursday, Oct. 20-23. Visit the 11th annual Study Abroad Photo Contest or partake in the International Food Fair on Tuesday, Oct. 21. Hear world traveler Andy Stoll talk about "How (and Why) to Travel Around the World) on Wednesday, Oct. 22, and compete in the World Trivia Contest on Thursday, Oct. 23. Check the schedule for more events. The Office of International Education hosts the week's activities. The College Park District parking garages and the surrounding area surface lots will be used for the Casting Crowns concert at College Park Center beginning at 3 p.m. Saturday, Oct. 25. Parking staff will collect a parking fee at each garage during this time. Traffic in the area will be heavily impacted, so make alternate arrangements for parking. Introduce potential and transfer students to UT Arlington by becoming a Maverick Orientation leader. Learn more about the position at an interest session at the E.H. Hereford University Center. Sessions are 3:30-4:40 p.m. today, Tuesday, Oct. 21, Concho Room; noon-1 p.m. Wednesday, Oct. 22, San Saba Room; 5-6 p.m. Monday, Oct. 27, Rio Grande Ballroom; and 12:30-1:30 p.m. Thursday, Oct. 30, San Saba Room. Learn more at the information session 2-3 p.m. Tuesday, Oct. 21, in Room B170F of the E.H. Hereford University Center. Claim your spot in two Homecoming traditions—the Chili Cook-Off and the Homecoming parade. Chili chefs will serve up hot stuff at noon-1 p.m. Wednesday, Nov. 19, on the University Center mall. Call Student Affairs for details at 2-6080. The Homecoming parade starts at 5:45 p.m. Saturday, Nov. 22, on Spaniolo Drive outside College Park Center. Register online for both events. Deadlines are Wednesday Nov. 12, for the parade and Friday, Nov. 14, for the Chili Cook-Off. The Information Security Office reports an increase in phishing campaigns that deliver malware through attachments and vulnerabilities affecting Microsoft Office and Adobe Acrobat. Read more about the phishing warning and safety measures you can take. 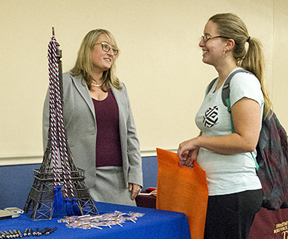 Amy Austin, left, assistant professor of Spanish, discusses graduate programs with Jasmine Schmidt, political science senior, at the Graduate School Expo last Wednesday. Formerly known as GradFest, the event drew representatives from more than 70 universities, colleges, and professional schools to tout the benefits of advanced studies. UT Arlington is a polling place for early voting for the November general election. The polling site is open 7 a.m.-7 p.m. Monday-Thursday, Oct. 27-30, at the Maverick Activities Center. The U.S. Centers for Disease Control and Prevention and the State Department have released statements advising against non-essential travel to Guinea, Liberia, Nigeria, and Sierra Leone due to the Ebola virus outbreak in those countries. Read more about CDC travel alerts. UT Arlington students, faculty, and staff requesting to travel to the listed countries or surrounding West African countries should submit a Request to Travel to Restricted Regions to the Office of International Education, per the University’s standard policies. The International Oversight Committee will review all requests on a case-by-case basis. For more information, contact the Office of International Education at 817-272-2355 or visit www.uta.edu/oie. Read more about UTA's Ebola health advisory. Understanding the rules and regulations regarding dropping a class is important before you make a decision about whether or not to drop a class. This seminar covers the drop policy and consequences of withdrawing from a course. Free. Noon, today, Tuesday, Oct. 21, Room 310, Ransom Hall. University College, Success Series. 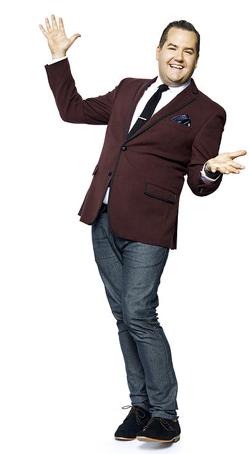 Talk show host and celebrity correspondent Ross Mathews presents "Straight Talk: LOL's and Advice from Your Gay BFF" at 7:30 p.m. Thursday, Oct. 23, in the Bluebonnet Ballroom of the E.H. Hereford University Center. He released his first book, Man Up: Tales of My Delusional Self-Confidence, in 2013. Tickets are $7 for students and limited to two per student. Others pay $15 per ticket. EXCEL Campus Activities sponsors the show. Alternative Breaks Fundraiser Purchase on-the-go food items to help fund the Alternative Winter Break trips. 11 a.m.-1 p.m., University Center mall. Alternative Breaks. The Big Event Fundraiser UTA's annual community service program receives 25 percent of proceeds. 5-9 p.m., Potbelly’s Sandwich Shop, 1301 S. Cooper St. The Big Event. Partial Solar Eclipse Viewing Use one of the telescopes with solar filters set up to watch the moon slip in front of the sun. Proper eye protection is essential when watching an eclipse of the sun. Free. 4:30-7 p.m., Planetarium. Friday Night Film: 'How to Train Your Dragon 2' Rated PG. Free fresh-popped popcorn while supplies last; other concessions for sale. Tickets $1, $1.50 with credit card. 8 p.m., Rosebud Theatre, E.H. Hereford University Center. EXCEL Campus Activities. Volleyball Mavericks vs. Georgia Southern. Tickets $3 with student ID. 6:30 p.m. College Park Center. Athletics. American Jazz Composers Orchestra Concert Hear the music of The Rolling Stones performed by Dallas/Fort Worth's top jazz musicians. Dan Cavanagh, associate director of jazz studies and associate professor of music, serves as artistic director. $10; call Box Office at 817-272-2669. 8 p.m., MainStage Theatre, Fine Arts Building North. Theatre Arts. Astronomy Day Enjoy discounted shows, telescope viewing, displays, presentations, raffles, and more. 2-10 p.m., Planetarium. Halloween Casino Night Enjoy Halloween in casino-style with games, refreshments, giveaways, music, and a costume contest. Free. 7-10 p.m. Thursday, Oct. 30, Bluebonnet Ballroom, E.H. Hereford University Center. EXCEL Campus Activities. Planetarium Open House Night free shows each Tuesday: TimeSpace, Oct. 21; Stars of the Pharaohs, Oct. 28. The fall schedule includes Astronaut; One World, One Sky: Big Bird's Adventure; Pink Floyd; Spacepark 360 Infinity; Two Small Pieces of Glass; and We Are Astronomers. Planetarium. Major Exploration Seminar Explore resources for choosing a major. Noon-1 p.m., Room 104, Preston Hall. University College, Success Series. Materials Science and Engineering Seminar Series Associate Professor Dennis Desheng Meng of the Multi-Scale Energy System (MuSES) Laboratory discusses “Scalable Nanomanufacturing for Energy Storage and Conversion Based on High-Voltage Electrophoretic Deposition.” Free. 11 a.m.-12:30 p.m., Room 229, Nedderman Hall. Materials Science and Engineering. Service Learning Workshop Learn what the Center for Community Service Learning offers and how to get involved. Free. Noon-1 p.m., Room 104, Preston Hall. Community Service Learning. Improving Brain-injury Rehabilitation Through Infrared Imaging Georgios Alexandrakis, right, professor of bioengineering, describes using near-infrared light imaging to monitor traumatic brain injury as well as guide the treatment-mediated brain rewiring in children with cerebral palsy and adult stroke patients. Light breakfast provided. RSVP. Free. 7-8 a.m., Wednesday, Nov. 5, Room 100, Nedderman Hall. Arlington Technology Association. The volleyball team relied on team effort for Friday’s five-set victory over Arkansas State at College Park Center and Sunday’s four-set victory over Troy in Alabama. The wins put the Mavericks at 18-5 this season with an 8-3 record in Sun Belt Conference play. At the Troy game, four Maverick players reached double-digit kills, four players notched double-digit digs, and three players registered a double-double. The team hosts Georgia Southern at 6:30 p.m. Friday, Oct. 24, at College Park Center. The Mavs are on the road to play Louisiana-Monroe at noon Sunday, Oct. 26, and Georgia State at 6 p.m. Friday, Oct. 31. The men’s and women’s cross country teams held their own Saturday at the Pre-National Invitational. The men finished 22nd among 46 teams, and the women placed 38th out of 43. The Sun Belt Conference Championship is set for Sunday, Nov. 2, in Mobile, Ala., and the NCAA South Central Regional is Friday, Nov. 14, in Fayetteville, Ark. The men’s golf team closes fall competition with the Royal Oaks Intercollegiate in Dallas starting Monday, Oct. 27. The ITA Regional Tournaments saw impressive action from the women’s tennis team in Waco and the men’s tennis team in College Station. The women play in the Wild West Shootout in Denton on Friday-Sunday, Oct. 31-Nov. 2. The men are in the Florida Gulf Coast Invitational on Friday-Sunday, Oct. 31-Nov. 2. Upcoming entry deadlines for intramural sports include table tennis, Wednesday, Oct. 22, and badminton, Sunday, Nov. 2.